Each year Congress enacts 12 annual appropriations (spending) bills. Those bills are the subject of vigorous and legitimate fights about spending priorities. Included in these annual appropriations bills are spending for defense, veterans, military construction, highways, housing, education (except student loans), foreign aid and the foreign service, the FBI, CIA, and Department of Justice, most of the Departments of Commerce and Labor, Congress and the White House, the Department of Homeland Security, including Border Patrol and Customs, highways, airports, and ports, health and energy research, scientific grants to universities, the Interior Department and Environmental Protection Agency budgets, national parks, … you get the idea. In contrast, several “mandatory spending programs,” aka “entitlements” are on autopilot. Spending occurs based on formulas written in law. Those formulas contain variables that change according to external factors (wages, inflation, food costs, health care costs). Most importantly, these programs are on autopilot. Spending continues from one year to the next according to these formulas unless the laws are changed. If Congress does not enact an annual appropriations bill this year for the Department of Justice, then DOJ will have to shut down on October 1st. If Congress does not enact a law this year affecting Social Security, Medicare, or Medicaid, those programs will continue spending money based on the automatic formulas within them. There are many smaller entitlements other than the big three (Social Security, Medicare, and Medicaid), but in an aggregate budget sense, it’s the big three that matter most. Payments to federal retirees and the refundable elements of tax credits are the next biggest. From an aggregate budgetary perspective, these big three programs are (i) huge, and (ii) growing faster than the economy. As a result, they are swallowing up the rest of the budget, and they are the principal source of future spending growth. These automatic spending increases that are “built into the baseline” are not carefully reexamined each year, and are not forced to compete with other priorities. The national parks, scientific research, and defense budgets are at a tremendous disadvantage – each year they have to compete for the marginal spending increase dollar, while the Big 3 entitlements quietly grow without anyone really noticing too much. If the President’s budget were to be enacted in full, four areas of spending would increase dramatically over the next ten years. The new health entitlement would go increase $100 B per year in 2019 (starting from nothing now). Non-defense discretionary spending would increase $74 B from this year to 2019. A collection of low-income cash support and food stamps programs would increase $61 B from this year to 2019. Federal spending on student loans would increase $29 B from this year to 2019. Importantly, these are proposed policy changes from the default baseline. Now let’s look at a picture and see where the increased spending would go. This graph shows increases in spending, comparing 2019 under the President’s budget to spending this year. To be clear, this graph shows the level of projected spending in 2019, minus the level projected for this year (2009). The amounts on this graph are increases above where we are now, measured in billions of dollars. The green bars show the President’s big spending increase proposals. You can see the big new health entitlement, the net effect of his new student loans proposal, and the spending-side effect of his “making work pay” credit and his expansion of the earned income and child credits. 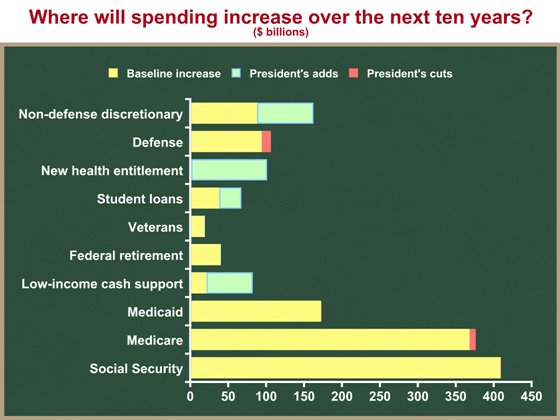 You can also see that he would increase spending for non-defense discretionary. The red bar on defense, in contrast, is the amount that he would shrink defense spending. You can see he would make a similar change in the Medicare spending increase. What about the yellow bars? They dominate the graph. They show the spending that will occur if we follow the baseline. For the top two bars, that’s a concept that we just do what we did last year, and increase everything by inflation. For everything else, that’s the effect of the autopilot effect of mandatory spending programs. Look at those bottom three bars. While we’re fighting about the new health entitlement (I’m opposed), federal Medicaid spending will grow $171 B without any Congressional Debate. Federal Medicare spending will grow (net of premiums) $367 B with almost no debate. And Social Security spending will be $408 B higher in 2019 than in 2009, if Congress keeps burying their heads in the sand for the next decade. By all means, let’s debate and even fight about the green and red bars. But if we ignore the spending increases in Social Security, Medicare, and Medicaid that occur without any changes to law, it will all be for naught. p.s. This trend gets worse in the second decade.